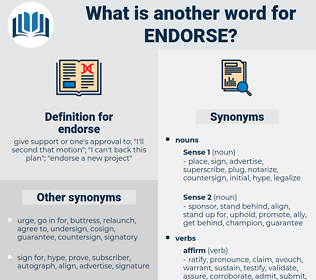 What is another word for endorse? give support or one's approval to; " I'll second that motion"; " I can't back this plan"; " endorse a new project"
rolled over and play dead. went on the record for. putting one john hancock on. favors, approve, welcomes, Ais, approves. AM, subscribe, approve, join, concur, confirm, acknowledge, encourage, share, recommend, echo, advocate, welcome, recognize, espouse, promote, applaud, adhere, emphasise, sympathise, recognise. lay, subscribe, confirmed, adopted, approve, countersign, validate, condone, embrace, corroborate, join, concur, confirm, underwrite, authorize, reaffirm, commend, acknowledge, encourage, substantiate, share, accede, Acceding, underpin, recommend, sign, signed, bolster, buttress, echo, enshrine, advocate, welcome, recognize, accredit, approves, shoulder, espouse, reconfirm, promote, rubber-stamp, applaud, adhere, emphasise, recognise, certify. refuse, Unauthorize, dissuade, discourage, halt, censure, attack, veto, renounce, reject, invalidate, repel, protest, oppose, disagree, criticize, disapprove. let down, baffle, dissimulate, screen, fail, disown, disavow, mask, foil, dissemble, desert, disappoint, deny, thwart, disguise, repudiate, secrete, veil, interfere, sabotage, cloak, cover, conceal, frustrate, hide. Sudden the patriot flame each province warms, Deep danger calls, the freemen quit their farms, Seize their tried muskets, name their chiefs to lead, Endorse their knapsacks and to vengeance speed. While the matter was still under discussion there came a messenger also from the commandant, to say that whatever the former deputation had proposed he, on his side, was ready to endorse. entric, enteric, endoergic, enterics, entourage.